At the Green Barn, we definitely try to be as “green” as possible. It is our belief that horses, like humans, perform best in their natural habitats, with excellent nutrition and health care. We are so thankful for our incredible vet, Dr. Marc Smith of Natchez Trace Veterinary Services, who utilizes the strengths of both Eastern and Western veterinary medicine and offers alternative treatment options like acupuncture, Eastern herbology and food therapy. Although medical intervention is often necessary and welcomed, we try our best to use all-natural and holistic approaches to suit our horses needs when possible. But what about vaccines? Are they really necessary? In a word – YESSSS!!! There are some REALLY scary diseases that can affect our equine family floating around out there… not the least of which are extremely difficult to treat and often lead to death. We definitely don’t make it a practice at our barn to over-vaccinate, but the following are required yearly vaccines for our horses. In my mind, it’s much better to be safe than sorry! Flu/Rhino – viral infection which usually presents as an upper respiratory issue; cough, runny nose, etc. Most horses can recover without major issue, but complications often arise and this disease is extremely hazardous to foals, geriatric or otherwise immune-compromised equines. EXTREMELY CONTAGIOUS TO OTHER HORSES!!! Strangles – bacterial infection, not a virus. Symptoms are similar to flu, but many horses with strangles go on to develop pneumonia or other issues. The typical time period of the infection is about 3 weeks even WITH antibiotic treatment. Again, this infection is EXTREMELY CONTAGIOUS TO OTHER HORSES and once a horse has had strangles, they remain a carrier for the rest of their life. Equine Infectious Anemia – also referred to as a “coggins.” Contracted from infected animal to infected animal through blood, milk and body secretions. EIA is most similar to HIV in humans, and is a terrible disease. All horses should be screened yearly to see if they are carriers. Some horses may be carriers, yet not show any signs of the disease for years and years. EIA is EXTREMELY CONTAGIOUS TO OTHER HORSES, but many years ago the USDA began regulating boarding farms and horse transport companies to require that all horses are negative for EIA. Because of this EIA is now extremely rare in the US… which is a GREAT thing! 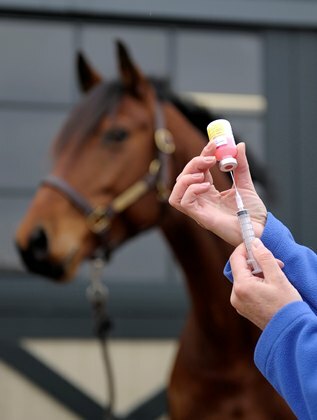 In summary – please vaccinate your horses! The vaccines are extremely safe and cost-effective, especially if you weigh the potential outcomes. Here’s to happy, healthy horses!